Studying Computer Science at top universities will also require A Level Mathematics. Computer Science is all about learning to reason. It can be seen as a series of puzzles with formal solutions. The first year is all about problem solving and learning to program. Students will have varying levels of programming skills so we will teach you how to write code from scratch. If you are a computer whizz then we have plenty of higher level activities to keep you going while the others catch up. We also look at problem solving methodologies like standard algorithms, decision tables and trace tables. In theory, we look at how information travels through a computer, different kinds of software, number systems, storing graphical data, external hardware and networking. In the second year you will develop your own computer system. This could be a revision quiz website, a educational app, a matrices calculator or a code breaking system – if you can find a customer, you can even get paid for your work! This is excellent preparation for the sort of individual projects and dissertations that universities demand. We take you through all the stages of project development from analysis to evaluation. The theory is demanding and wide ranging, moving quickly across a broad range of topics from the Turing model to databases and normalisation of numbers to big data and programming paradigms. You need to be prepared to puzzle things out, to abstract information, to recognise patterns and to apply your knowledge. 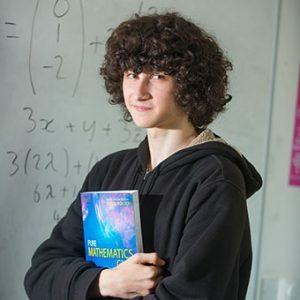 Read more about Joshua and some of our other students.